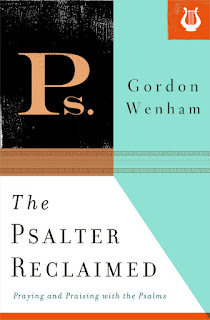 Gordon Wenham's book The Psalter Reclaimed: Praying and Praising with the Psalms is a collection of Wenham's writings from various sources, all collected into one convenient Psalm-centered volume. I chose to read this book because I need a new and fresh familiarity with the Psalms. I don't know them as well as I ought to, and much of the Psalter is strange to me. It is difficult to always know how to interpret or apply what we read in the Psalms to the readers, prayers, or worshippers who are utilizing them today. In the first chapter, Wenham speaks of the importance of the Psalms. He talks of their historic pedigree and their importance throughout the history of the church. In the remainder of the chapter he discusses recent scholarship regarding the relationship between speech-act theory and the corporately spoken nature of the Psalms. Wenham essentially argues that there are important "similarities between taking an oath, making a vow, confessing faith, and praying the psalms." Singing the Psalms, says Wenham, actively committ the singer "to following the God-approved life" (35). It is not merely the repetition of an external series of words or merely an act of worship. In Chapter two, Wenham argues that "we ought to pray the psalms regularly as Jesus and the apostles did, and as the Christian church did as well for about eighteen centuries" (40) Don't panic - he is not arguing for an exclusive psalmnody position. But he does at least note that the psalms have fallen into being used less than they were before the introduction of hymns in the 18th century and that this trend should be reversed. His argument is that the Psalms instruct the church in how to praise God and how to lament in times of trial and pain. They also help us in our repentance by modeling what true penitence looks and sounds like. Ultimately, the Psalms point to the Messiah. The chapter points out that the Psalms are all useful. "We should use all of the psalms, not just the cheerful or sentimental ones that take our fancy" (55). 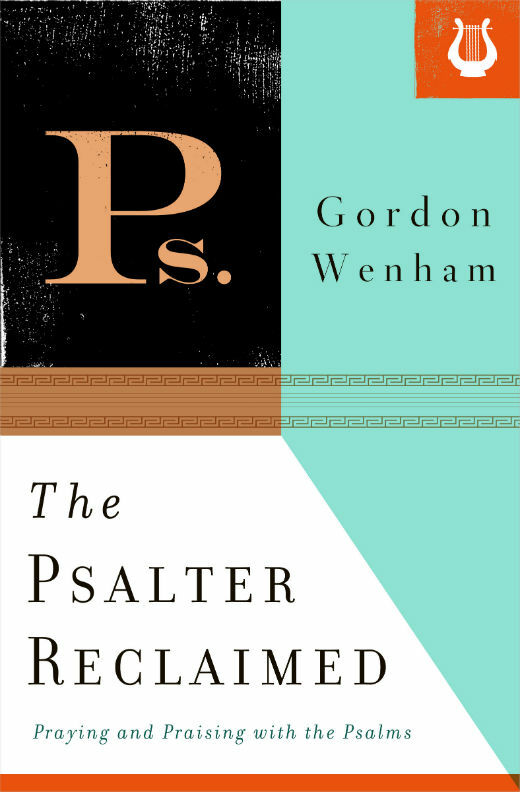 In Chapter three and four Wenham turns his attention to tracing the modern developments in reading the Psalms canonically as well as Messianically. He concludes that (1) we should read the Psalms in the canonical context of the whole Psalter. (2) We should read the Psalms in the context of the Hebrew Bible. (3) We should read the Psalms in the context of the "Christian canon of the Old and New Testaments" (77). As for chapter four, he defends the idea that the psalms can (and often should) be read with a messianic expectation, and he argues effectively that the editors of the Psalms certainly had that expectation. Some very interesting hermeneutical discussion occupies this chapter. In chapter five, Wenham explores the subject of the relationship between the law (decalogue) and the Psalms. The Psalmist repeatedly rejoices in the law of God (Ps. 119). "To rejoice in God's judgment on sin is to turn the spotlight on one's own life and behavior: will I pass muster with God?" Wenham's chapter brings out many insights as to what is really involved when a worshipper delights in the justice and holiness of God, which are revealed in God's Law. Most readers, I suspect, will be most interested in Wenham's discussion of the impreccatory Psalms, which is what the sixth chapter covers. He gives an overview of various approaches to these Psalms - from Calvin to Kidner - but then offers Erich Zenger as offering the most helpful approach to understanding these Psalms. Zenger essentially approaches the Psalms by saying that Christians are functionally marcionite if they reject the impreccatory psalms as "sub-Christian" or as outdated Old Testament literature. According to Zenger, the impreccatory psalms serve the important purpose of giving voice to the very real human need for divine justice. "These psalms awaken our consciences to the anguish of those who suffer. They serve to waken us from the dreadful passivity that has overtaken the comfortable churches of the Western world. They make us long for the coming of the kingdom of power and justice" (135). He concludes this important chapter by reminding readers that although Western Christendom may not experience martyrdoms and injustice (and hence are offended by something like Psalm 109), much of the church around the world does experience such horrors and injustices as the Psalmists when they wrote the Psalms, and it is on behalf of such suffering brothers and sisters that we can appropriately pray the impreccatory psalms. Chapter seven is a straightforward exploration of the concept of God's "steadfast love" as found in Psalm 103. Finally, the eighth chapter comes from an unpublished lecture of Wenham's where he discusses the subject of "the nations" in the Psalms, moving canonically from Psalm 1 through 150. Yes, the nations set themselves against God for much of the Psalms, but they also end on a note of hopeful expectation that the nations may yet come in to God's fold. The greatest strength of this volume is that it immerses its readers in the world of the Psalms. You come away from this reading with the impression that the church today has undoubtedly neglected a rich source of material for worship and for her edification. The volume does have a weakness, however, and that is its disconnected nature. Because each chapter has its origins in separate projects that were collected together, there is some disjointedness. The last chapter in particular, feels tacked on and I certainly found it difficult to know why it was there in terms of the larger whole of the book. All in all, this volume is for those who, like me, have neglected the Psalms and who have not thought deeply about the role that the Psalms are to play in the life of the church. Readers will undoubtedly be edified and benefit much from Wenham's work. I'll echo the thoughts about singing the psalms. While Christians may disagree about what the "hymns and spiritual songs" mean in Col 3:16 and Eph 5:19, most agree that "psalms" means the book of Psalms, and yet most Christians, including myself for many years, never even try singing them. We really are missing out on an inspired treasure trove, a Spirit-given song book included right in our Scriptures! It has greatly increased my understanding and love of the Psalms to sing them. If you're interested, the Westminster Assembly issued the "Psalms of David in Metre", which though a little difficult to sing sometimes (syllables are often pronounced unusual ways), the entire psalter is done in Common Meter, and can be sung to the tunes of "Amazing Grace" or "I Sing the Might Power of God", to name a couple. Try Psalm 1 to the latter, for example. No Court of Appeals for the PCA?